I feel led to talk to you about certain issues of the moment because of our shared bond in Christ and common destiny. Although I’ve never met you personally, my view of you and of your compatriots (saved and unsaved) are of caring, outgoing people, eager to share their blessings with the rest of the world. Examples abound of schools, hospitals, churches, water projects and lots more built in different parts of the world from your generosity. The issues I want to address stem from your just-concluded presidential election and its aftermath. It makes no difference who you voted for, God has graciously assisted in a transition of power at the White House. This is a source of hope to those from other parts of the world with more fragile systems where the deep divisions and bitter disagreements that arose in your polity in the recent past could easily have degenerated into prolonged armed conflict. You are an example to the rest of us. So more or less, as I’m talking to you, I’m talking to every other believer on the planet who is not yet facing unmitigated persecution for their faith. For according to Bible prophecy, these things are coming. No one can say exactly when but the indications are that the end is near. It will only be a while before the train wreck that is called globalisation steamrolls in with the one world government and the unveiling of the anti-Christ. (2 Thessalonians 2:3-8, Revelation 13:16-18). I will leave the seminary-trained brethren to debate whether the saints will be here when that happens or not. My concern is, what should you, what should we, be doing in the interim? The way the Barak Obama administration was moving, it seemed that things were coming to a head spiritually fairly swiftly. But with intercession from some within your ranks and some believers around the world, you seem to have bought yourself a little time with the inauguration of a new president, who acknowledges God, in the person of Donald Trump. He may not be a shining example of a Christian but He acknowledges God and is concerned about the way America let things lapse to the point where you guys are now endangered on home soil. This may not seem like much to you, but it’s a lot to go on to do the things that need be done to prepare the church for the end, a huge part of which is a great harvest of souls. 1. Watching and analysing every move made by Trump and every word he speaks: In the grand scheme of things spiritually, you are more important than Donald Trump. It does not matter whether you belong to any of the arms of government or you are an ordinary citizen. God has appointed him your servant. You can direct him (and the rest of his administration) on your knees, not to make life super comfortable for you or anyone else, but to provide an enabling environment to foster revival and spread the gospel within and without your borders. Trump does not have to speak with all the delicacy you desire to do this. Stop dissecting his words and actions to see how refined and becoming they are of his office or how inclusive and representative they are of the America you cherish, the America you may feel he’s out to destroy. Stop instigating and fighting “wars” against Trump and his administration that have little bearing on God’s end-time agenda. When Nehemiah wanted to go and rebuild Jerusalem, he got permission and funding from the pagan king, Artaxerses, by appealing to God (Nehemiah, chapters 1 & 2:1-8). How much more will you get what you desire of God in this dispensation that pertains to the expansion of His kingdom before the curtain is drawn on this age! 2. Fighting among yourselves along theological and political lines, thereby pulling down your witness before those who hate the Lord: Disagreements are inevitable but when you are so caustic in your condemnation of fellow believers, when you breach fellowship on the ground of spiritual non-essentials and political leanings, you make yourselves a joke to the rest of the world. However, powerful anointing flows when you are united. No matter how you water down your message and make room for this and that (LGBTQIA…, unconditional abortion rights, inter-faith initiatives, etc. ), it will never be enough! The world will demand and demand more grounds and keep putting you on the spot until you begin to push back. I suggest you begin to do that right away. Or you’ll end up confusing yourself and making the way to God fuzzy for those who would believe. No matter how hard you try, the world will still think you’re a moron for believing in God. They will consider God’s plan of salvation through the death of Christ laughable (if you’re bold enough to share it). But therein is God’s power and yours. Now, none of this is unfamiliar because these are those days the Bible speaks of above. It’s a waste of time trying to satisfy folks like these. More than that, it’s a violation of God’s express commandments. Preach the unadulterated truth, the raw gospel that is able to bring souls into the kingdom, plant them and see them reproduce after their kind. No more patting of people on the back, “You’re loved, you’re beautiful, just do your best and everything will be fine!” On what basis? That is not the gospel. “Your happiness is more important than anything else!” Really? The gospel is “offensive,” people! It says, “Repent for the kingdom of God is at hand! Turn from your sins and embrace the Son of God, Jesus, whose blood was shed as an atoning sacrifice for your sins.” There’s no love without accountability, everyone is ok as they are, in the Bible. Quit the feel-good, motivational stuff. It will pack your churches and open-air neetings full but it won’t get souls into the kingdom of God. Time is of the essence! Don’t fritter it away on appealing, ear-tickling stuff that lacks regenerative power. The true word of God does not affirm evil, rather it corrects it. 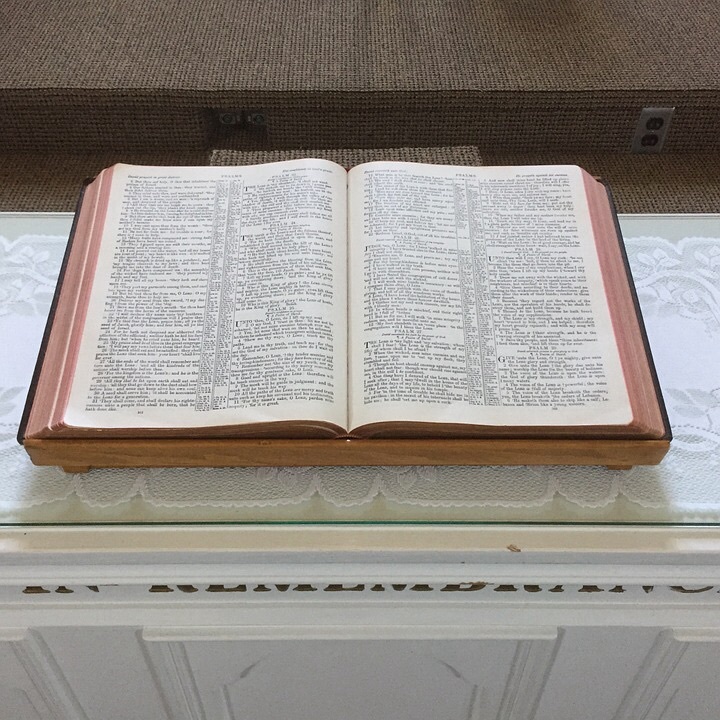 “All Scripture is breathed out by God and profitable for teaching, for reproof, for correction, and for training in righteousness” – 2 Timothy 3:16. If you feel convicted by this message, ask God to restore or establish your focus and that of other believers on the things that really matter within the window of opportunity He has given to America and the world. Almighty God, Creator of heaven and earth, I humbly come to be reconciled to You through the redemptive work of Christ on the cross. I repent of my sins and receive Jesus as my Lord and personal Saviour. Write my name in the book of life and fill me with Your Spirit to teach and guide me in the way of righteousness via your word. Thank you, Lord, for I am now saved and await my Lord’s imminent reurn in Jesus’ name. To know more about me, see my bio. *I learnt the term, “Indian summer”, in the mid 1990s as I sought to understand my Bible better. It was used in one the books I devoured then, The Lion Handbook to the Bible, The reference was to the period of prosperity and expansion Israel (the northern kingdom) enjoyed under King Jeroboam II as prophesied by Jonah, son of Amittai, after a time of decline (2 Kings 14: 23-29). The time was not properly used by the people, though, because godlessness abounded in the land. Warnings by Amos the prophet and his like were ignored with the result that the nation subsequently suffered God’s judgment. The Lion Handbook to the Bible, Special Edition, edited by David and Pat Alexander (Lion Publishing, Tring, Herts, England, 1983), p. 444. 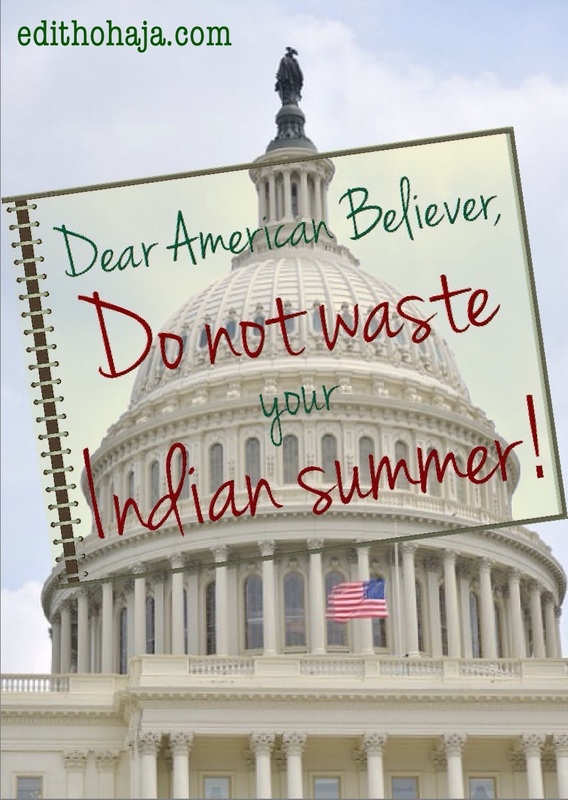 Kindly suggest other things Christians in America should refrain from doing in order not to waste their Indian summer. This is definitely a message to ponder and take before the throne of grace. Thanks for sharing, Edith. As I can relate to much of what's been written. God bless you. Yes and Amen. Blessings to you also!? Life without Christ is in crisis and this lovely write up is really encouraging. I believe you've ministered to many. I hope so. Glory to God! The message of Christ remains new every moment, the problem is that we forget so easily what the scriptures say and tend to act the way we feel to be acceptable in our eyes when we come across some situations. The Bible clearly states the events and signs that will accompany these last days and as such we need to be very proactive, knowing that some things happen in order to divert our attention. God will help us to make good use of this gracious message. Thanks a lot, Ma. Thank you too, Benjamin. I pray so in Jesus' name. God is wonderful and graceful. Unity is what we need in Nigeria today. Ma'm may Yahweh bless you for this inspirational post. Thank you, Stanley, and may God bless you too. What a great word, Edith. Such passion in your heart and I appreciate you sharing that with us. I loved this conversation and if ever you want to continue it with me, feel free to message me! Blessings, my friend! Thanks a whole lot, Jaime! I really appreciate your sentiments and offer to talk further. Love the work you are doing for God and building others who are serving as well. I pray overflowing grace on you in Jesus' name. This write up is one that everybody can relate with. Some of the modern day churches have so twisted the gospel to suit the world. Even some religious leaders have joined in this misnomer and have resigned to the "tell them what they want to hear" policy. This is bad as this generation is headed towards vanity. No one wants to hear the truth any more, they all want to be patted at the back and made to believe that all is well with whichever action they choose to carry out in the running of the race. This write-up is a very nice one, am happy it cited some Bible passages that vehemently condemn these acts and warn against them without sugar coating the matter in any way. You either choose to hear and abide by the word or condemn yourself to damnation. The Bible has made all these things clear. As for the American administration, I pray that God will through it bring redemption and revival to Christianity and the church of God at large. God bless you richly, Ma, for this eye-opening article. Thank you for your comment, Vivian! God bless you too. Edith, I love this! We definitely need to be praying for each other and those in leadership instead of fighting them. Thank you for sharing your heart. Thanks a whole lot, Lori! Glory to God! You're right about the need for prayer. I just came across an article on lifesitenews.com that is more or less a point-by-point call for prayer. It also provides a more detailed background based on international affairs and Biblical insight to help us understand the vitriolic attacks on Trump by the mainstream media and others. Dear Edith, This is a very encouraging read indeed. In your observations of Americans you honed in on some crucial points saying, "Fighting among yourselves along theological and political lines, thereby pulling down your witness before those who hate the Lord." Those Christians who compromise the gospel as you say, "Striving to make yourselves acceptable to the world." You said, " A new president, who acknowledges God, in the person of Donald Trump. He may not be a shining example of a Christian but He acknowledges God." My dear sister Jesus tells us in Matthew 7:20, "By their fruit you will recognize them. Are grapes gathered from thornbushes, or figs from thistles?" Mr. Trump may be familiar with the drift and effects of Christ doctrine but his fruit demonstrates that his temper and conduct is contrary to the mind of Christ. Therefore we cannot as you say, "Stop dissecting his words and actions to see how refined and becoming they are of his office or how inclusive and representative they are of the America you cherish, the America you may feel he’s out to destroy. Jesus used the phrase “watch and pray” several times. “Watch and pray.” The word translated “watch” means “to have the alertness of a guard at night. We are not called to mindless citizens. Americans had the alertness of a guard at night with Mr. Obama as everything he said and done was dissected and evaluated. Mr. Trump should not be treated any differently. Matter of fact in your country your leaders are treated with the same alert of a guard by their citizens. Because there is good and evil in this world people will not stop instigating and fighting “wars” against any leader or their administration until Jesus comes back. Jesus told us that the Gospel is a dividing sword. Because it divides the opinions on good and evil there will always be conflict. *"Do not assume that I have come to bring peace to the earth; I have not come to bring peace, but a sword. "* (Matthew 10:35) Christ foretold troubles, telling us not only would these encounters of friction be with non-believers but with believers, friends, family and foes. Not that the troubles and conflicts should be a surprise, but that they might confirm their faith. Therefore there is nothing that have bearing on God’s end-time agenda it will come to pass regardless who is in office. Thank you as always you bring insightful truths that inspire deep reflection that drive us to the word for answers and understanding. Love you much! Hugs and Kisses to you dear one. Thank you, my beloved sister! Keeping government accountable is good but if we obsess over minor issues, we miss the big picture. You need to know that the mainstream media are misinforming people with twists on the truth and outright lies, so sometimes the things people are working themselves up for may not be as presented. The end times are here, no doubt, but the way things were unravelling under Obama would have put Christians in greater peril much faster, hence the Indian summer allusion. Perhaps, you should check the post I just shared on my Facebook timeline that paints a more detailed picture of what is going on on the international scene and how the American situation pertains to it. Love you, sis, as always. You are super blessed in Jesus' name. ?? And bless you too, Onyeka! Those who always find fault with people will definitely have no reason to believe in them. If the Americans should join the rest of the world and condemn their president, perhaps 'cause of what he said or his actions in the past, I don't think he can ever do well in that office?? I like that you put a question mark there. The Bible says to pray for our leaders. Believers can't afford to behave like unbelievers who don't feel accountable to anyone and want to tear other people and everything down when they can't have their way. dear,mom,edithohaja.personally i love the way embellishes this story with words of God,but what of non-Christians out there,don't think is offensive to them ma.However,many people know that Obama and his Administration twitted many things in America in of accommodating every sets of an individual(s).thanks ,keep it up. I'm at a loss as to what your complaint is. The letter is directed to Christians, hello! I think I agree with Lori. Prayers is the ultimate, God can do all things. Instead of fighting the leaders, let's all remember them in our daily prayer because uneasy lies the head that wears the crown. God bless you Aunty!!! God bless you too, Joy! It's easy to criticise and tear others down but we shouldn't do this always, esp with our leaders. There is something called constructive criticism. It seeks to build, rather than destroy. It points out errors but also proffers solutions and gives the leaders the chance to implement their ideas for the good of the polity. The world needs peace, harmony and greater unity... how i wish it will get to Americans. keep it up, Dear Aunty Edith, my mentor! And to us too, JC. Nigeria needs urgent divine intervention right now. Wow! I was blessed by this. Well done ma and more grace to you. More grace to you too, Chidinma, in all you do in Jesus' name. Edith, You bring up many good insights here. I thoroughly enjoyed reading this. You bring a lot of clarity and focus. It is so refreshing to read your thoughts and the Bible verses you chose for this article. This gives me food for thought! Thank you for sharing! So so glad to hear that, Leslie! May God help us to unify and do His bidding for the spread of the Gospel in these last days in Jesus' name. U ar really innovative and an epitome of Excellence really enjoyed every bit of ds post. Tnk u MA for impacting in me. Glory to God and blessings to you, Nkemjika! Grace is not available forever! The little opportunity we have should be dedicated to show example through our lives, our words and actions, But more especially as the Bible commands us in Acts of the Apostles chapter 1:8 we should be his witnesses and ambassadors on earth. So right. Bless you, Ogechi! Adigun Temitope (DATI) I concur to what Pamela Johnson said about Trump not having the mind of God. Well, as far as I'm concerned, there are differences between acknowledging God and having the mind of God but the question is: Is Trump not acknowledging God only for campaign purpose?. Through this piece and Pamela's comment, I'm able to understand the differences in another dimension. This piece should be recommended to Nigerians too. Bless you ma in multiple folds. Bless you too, Deacon, although I can't say I clearly got you. God bless America! Howbeit, it is a message for us Nigerians too. God said for us to pray for those in authority, not condemn or judge them. There have been men who never feared God that he used as instruments. Pharaoh of Egypt is a good example. The man was probably not as hard as the Bible depicts him to be, it was actually God who hardened Pharaoh's heart to prove His mighty powers. Was it for vain displays? No! He was going to teach the Children of Israel faith; to know how great He was and that He was back of them. Apostle Paul having this understanding declared therefore that all things (men, government, policies, economies etc) work together for our Good. No government or policies can work against the one that loves God. To love God is to keep His commandments, one of which is to pray for them that have the rule over you! If you do this thing, you will find that where men are cast down by the same government, you will be lifted up! Some Christians are yet to understand how the Kingdom functions. There are laws and principle that work like the law of gravity; they are there for your good, ignoring them will mostly lead to walking against them which will work against you. PRAY FOR YOUR COUNTRY STUDENTS PRAY FOR YOUR LECTURERS. Shalom! Very good! You're very right, God wants us to pray for our leaders. And I like that last bit about praying for lecturers. Amen and Amen in Jesus' name. May God enlarge your coast, Prince, in Jesus' name. I hope Americans take these words of admonition seriously. As a prospective american citizen, I have though!?. On a serious note though, Americans should thank their stars for the gift of Donald Trump. Trump is a proof that God never abadons his people! Exactly how I feel, Chinekwu! Unfortunately, some see Trump as quite the opposite. I believe it won't be long though before it all becomes clear. I think all we need do is to pray for those in leadership because if we don't, whatever decision they take either affect us directly or indirectly. Funny! You didn't read it, my girl! You are blessed nonetheless. Thank you Ma. This reminds me of, "Think not on what America can do for you, but rather think of what you can do for America". You are a blessing, may God continue to empower you. I pray God give us strength to fight for what is right and never let the devil win. We should learn not to mix Christianity and politics. Christians should pray for their leaders and not feel reluctant to. When the righteous is on the throne, the People rejoice . Though Trump aint perfect. A great message in desperate times to a desperate people. I have come to understand that God's choices of His instruments to get His work done do not usually fit man's idea. Men God used to cause radical changes in the course of history are always controversial & easily misunderstood. Controversial because they do things differently and are always in opposition to the ways of the people they want to change. For example, Elijah and Our Lord Jesus. Of course Satan is always behind the scenes, working to discredit God's servants before the world and get the world to infiltrate God's people with worldly opinions. It's sad the American Church is falling for this. Point 2 in your message is very key. The church must never allow anything to divide them. Once the arch enemy, the Devil, can divide the Church, he will succeed against her. We must never be divided along any lines, for our common denominator is Jesus, the Christ. The Church in America must look away from the weaknesses of Trump and pray for him. If you know about Trump before he became the president, you will not be surprised at how he talks. He needs prayers from all who love God. If witches are united across the world to hex Trump, how much more should Christians in America and elsewhere pray for this man being used of God to delay the manifestation of the man of sin (Anti-christ)! Let's not forget, Satan's strategy is to remove our eyes from the work God is doing through his Servants to the faults or weaknesses of the Lord's vessels because he (Satan) knows man is not perfect. That's why he is called the "accuser of the brethren". Let's pray for one another. Thanks for sharing, Aunty Edith. Thanks for your profound comment, my brother Sunday. May God help us to focus on the things that bind us as believers and unite to do His work while there is time. Amen in Jesus' name.